TheRiverKwai.Com - Museums in River Kwai. There are a few museums on the River Kwai in Thailand that are well worth a visit. We've included some information on this page to give you an idea of what to expect. A small Tambon located on the bank of the Kwai Noi River approximately 35 kilometers from the city is a site where some ancient Stone Age tools were found. In addition, a Neolithic burial site was discovered by the Dutch Allied POW, Dr. Van Hickderen, who was forced to build the Death Railway. The consequences of findings revealed that tambon Ban Kao was once a dwelling of prehistoric men. Some critical discoveries included skeletons of prehistoric men, tools made from gravel stone and axes. The Ban Kao Museum houses skeletal remains, pots, axe heads, jewellery made from animal bones and other artefacts dating from that period. The War Museum is one of two war museums about the Death Railway built in 1942 / 1943. It is located only 300 metres from the Bridge on the River Kwai in Kanchanaburi. 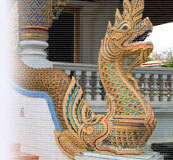 The Museum is located in the grounds of a temple at the junction of the Kwai Yai and Kwai Noi Rivers. The Burma Railway, also know as the Death Railway, the Thailand - Burma Railway and similar names, is a 415 km railway between Bangkok, Thailand and Rangoon, Burma, built by the Imperial Japanese Army during World War II, to support its forces in the Burma campaign. Forced labour was used in its construction. About 200,000 Asian labourers and 60,000 Allied prisoners of war worked on the railway. Of these, around 100,000 Asian labourers and 16,000 Allied POW's died as a direct result of the project. The railway connection between Thailand and Burma had been surveyed at the beginning of the 20th century by the British Government of Burma, but the route - through hilly jungle terrain divided by many rivers, was considered too difficult to complete. Tiger Temple, or Wat Pha Luang Ta Bua, is a Buddhist temple in Western Thailand which keeps numerous animals, among them several tame tigers that walk around freely once a day and can be petted by tourists. The Theravada Buddhist temple is located in the Saiyok district of Thailand's Kanchanaburi province, not far from the border with Myanmar, some 38 km north-west of Kanchanaburi along the 323 highway. It was founded in 1994 as a forest temple and sanctuary for numerous wild animals. In 1995, it received the Golden Jubilee Buddha Image, made of 80kg of gold. In 1999 the temple received the first tiger cub; it had been found by villagers and died soon after. Several tiger cubs were later given to the temple, typically when the mothers had been killed by poachers. As of 2006, over ten cubs had been born at the temple and the total number of tigers was about eighteen. All of these are Corbetts Tigers, except Mek (a Bengal Tiger). They spend most of the time in cages, being fed with dry cat food and cooked chicken to avoid giving them a taste for blood, and washed and handled by monks. Once a day, they are led on leashes to a nearby quarry. Originally they would roam around freely in this area, but now with the increase in tourists will often be chained as they get grumpier in the afternoon. A group of Thai staff and some volunteers lead tourists around by the hand to pose and pat the tigers and taking photographs of them using the tourist's camera, while the abbot and monks keep the tigers happy and under control if they get irritated. Nervous tourists may also observe this from about 10m away. The Tiger Temple practices a different conservation philosophy than in the west. In western zoos and parks, the emphasis is on providing a natural environment for the animals. In the temple, at least until the sanctuary is completed, the animals seem to be treated more as family members. Although it may be possible for the offspring of the current generation to return to the wild, their parents will live out a life of non violence. Their conservation philosophy seems to be working, as while projects elsewhere often need to resort to artificial insemination, over 10 cubs have been born at the temple in the last three years despite having no breeding program whatsoever. This cemetery contains the remains of 6,982 war prisoners who lost their lives during in captivity of the Japanese Army that forced them to build the Bridge over the River Khwae and the Death Railway. The Japanese following their invasion of Thailand during World War II, brought British, Dutch, Australian and American prisoners to Thailand by the Southern route. Impressed labourers were also used to complete the rush construction of the railroad, which is an alternative to the sea route, to Rangoon via Singapore and the Strait of Malacca since the sea route was being closed in by Allied submarines and aircrafts. The Chong-Kai Cemetery is smaller but more peaceful than the one in town. It is also neatly arranged with all kinds of beautiful flowers planting, and hedged. It contains the remains of 1,750 prisoners of war. This place can be reached by boats which are available at the pier in front of the town gate and also from the agent at the Bridge. Looking for hotels or self catering accommodation in River Kwai? Check out our accommodation section for some great deals and book securely on-line. There are countless attractions in River Kwai to suit all tastes - check out our attractions page for full details. The dining scene in River Kwai is a wonderful experience. You'll find a diverse range of venues on TheRiverKwai.Com.